Sandra Silvestri Reports on JDFI World Diabetes Conference.. JDF Has "Embraced the Ribbon"
Ribbon Goes to White House--Ron Brenners Gives Ribbons to Chief of Staff. Background. Registry data on patients with type 1 diabetes mellitus who undergo pancreatic islet transplantation indicate that only 8 percent are free of the need for insulin therapy at one year. Methods. Seven consecutive patients with type 1 diabetes and a history of severe hypoglycemia and metabolic instability underwent islet transplantation in conjunction with a glucocorticoid-free immunosuppressive regimen consisting of sirolimus, tacrolimus, and daclizumab. Islets were isolated by ductal perfusion with cold, purified collagenase, digested and purified in xenoprotein-free medium, and transplanted immediately by means of a percutaneous transhepatic portal embolization. Conclusions. Our observations in patients with type 1 diabetes indicate that islet transplantation can result in insulin independence with excellent metabolic control when glucocorticoid-free immunosuppression is combined with the infusion of an adequate islet mass. To read the entire original article click here. While the AIDS Quilt travels around the country, the Diabetes Memorial Quilt hangs in cyberspace. The quilt remembers all those who have died of diabetes. Arlene Shapiro created the virtual memorial two years ago and put it on the World Wide Web for people to view and add names of their loved ones. Diabetes Interview spoke to Shapiro about her work on the quilt. Diabetes interview: Why did you decide to create the qulit? Dl: What effect would you Iike the quilt to have on its viewers? AS: Of course, the main purpose of the quilt is to provide a place for people to pay tribute to those who died from diabetes and its complications. But I hope that in some way the quilt also helps to raise awareness about the devastating nature of this disease. Unfortunately, too many people think of diabetes as a simple, little sugar problem. Di: What reactions have you received from visitors? AS: I receive many messages praising the quilt and thanking me for memorializing people I never knew. Dl: On the site you mention that diabetes is underreported on death certificates. AS: While diabetes might not be cited as the cause of death on the death certificates of those listed on the quilt, each was diabetic and the disease in some way contributed to his or her death. I think it’s important that people understand this. Dl: How do you find out about all the peopie who have died from diabetes and how do you maintain the virtual quilt? AS: Maintenance of the quilt page actually consists of adding names and other information, and checking the page with different browsers on three different computers from time to time. Most of the names are sent to me by email from people who have discovered the site. Some of these emails include just names and dates, and perhaps the place of residence or birth. Others contain heartbreaking stories about their deceased relatives and friends. I wish I could indude these poignant tributes on the quilt but I have to limit the amount of information. I do answer each email personally. DI: What is your motIvation for this work? AS: I am a type 1 diabetic (an insulin pumper) and on a personal level, I certainly know what having diabetes entails and how serious diabetes really is. The names on the quilt represent such a small percentage of the people who have died from a disease that should have been cured long ago. The sad part is that many more names will be added here until we do find that cure. President Clinton wore a Silver/Gray diabetes awareness ribbon when he signed the bill that would designate federal funds to "fight diabetes." President Clinton yesterday hailed a lesser-known part of the balanced-budget deal -- new federal funds that will be devoted to helping research and treat diabetes. Clinton, speaking at the Georgetown University Medical Center, struck an emotional note in highlighting the new initiatives against diabetes, which claims the lives of some 150,000 Americans annually, making it the nation's seventh-leading cause of death. Clinton described how a friend who was his campaign manager in his first political campaign -- a failed bid for the U.S. House of Representatives in 1974 -- succumbed a few years ago to diabetes complications. And he recalled how a person who used to sing in the choir at his Little Rock church had to stop when his diabetes became too severe. "I have these vivid memories every Sunday, of standing there looking at him sitting in the church with the pain on his face of not being able to do it anymore." The recently enacted budget accord contained three diabetes-related provisions. The largest, costing $2.1 billion over five years, expands Medicare coverage to allow more people to be reimbursed for monitoring their own diabetes with blood-glucose test. Under current law, Medicare pays for the blood-glucose strips needed for self-monitoring only for those patients on insulin treatment programs. Under the new law, all diabetes patients, regardless of their treatment regimen, can be reimbursed for blood-glucose monitoring. Also, the bill allocates $150 million, over five years, for the Health and Human Services Department to spend on research for juvenile diabetes research. The agency will receive another $150 million over five years to spend on diabetes prevention and treatment among Native Americans, a group that suffers from diabetes at a rate three times higher than the population as a whole. Finally, Clinton announced a public-private initiative known as the "Diabetes Quality Improvement Project." The federal government's Health Care Financing Administration will work with the American Diabetes Association and other groups to find ways to share information on treatments for diabetes, with an eye toward highlighting the most effective methods and ending what critics view as widely uneven levels of care. Among the people who introduced Clinton was Mary Delaney, a District resident who suffers from diabetes and said because of cost she has not been able to monitor her blood sugar levels as often as her doctors have recommended; and Sandra Puczynski, an Ohio mother who described her distress when her child was diagnosed with diabetes several years ago. On the stage, although she did not speak, was actress Mary Tyler Moore, who is a diabetes sufferer and is chairwoman of the Juvenile Diabetes Foundation International. Clinton offered special praise yesterday for House Speaker Newt Gingrich (R-Ga.), who advocates for greater diabetes spending and was an ally in the budget debate. Gingrich was not present at Georgetown yesterday, but Clinton said the speaker has "watched his mother-in-law live with diabetes and became a great champion for people struggling with it, a tireless advocate for greater investments and research, prevention and care, and one of the very first people who ever spoke to me not only about the human dimensions of the disease." doctors offices, hospitals--wherever there are people. Just about everyone knows someone who has diabetes. We hope the day will come when we can say that "everyone knows someone who had diabetes and was cured." Wilma Reiber, one of the Campaign founders and a diabetes-cure activist, reports that the "ribbon" was very well received at the Whittier Institute's "Taking Control of Your Diabetes Conference" where she managed a Ribbon Campaign booth for the purpose of educating visitors and distributing ribbons. The conference, attended by 700 people, was held in Seattle, Washington on May 31. A subsidiary of Scripps Health, the Whittier Institute is dedicated to diabetes research and patient care through a collaborative program with the University of California at San Diego. The "conference" is an annual event held in San Francisco, Seattle, San Diego, Las Vegas and Indianapolis. Whittier's involvement with the Ribbons began when, at Wilma's request, Dr. Steven Edelman, founder and director of the conference, announced the Ribbon Campaign at the San Francisco conference earlier this year. For further information, visit the Whittier conference web site. Mark this date on your calendars. Please write your legislators and ask that they issue proclamations declaring November 13 as Gray Ribbon Day in their districts, towns, cities, etc. Use the San Francisco proclamation (pictured below) as an example. 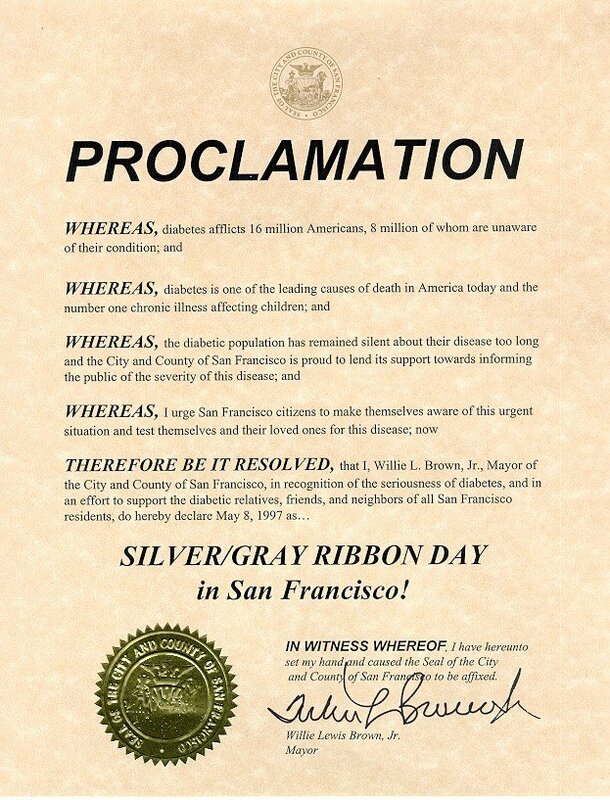 Thanks to the efforts of Wilma Reiber, one of the Gray Ribbon Campaign founders, the following proclamation was issued by Mayor Willie Lewis Brown, Jr. May 8, 1997 was the first Gray Ribbon Campaign Day. The following proclamations were issued by John Longstreet, Mayor of Plano, Texas and Glenda Hood, Mayor of Orlando, Florida. Many thanks to Ron Brenners of Plano and Martin MacArthur of Orlando for making this happen. Whereas the City of Plano [Orlando] wants to lend its support toward informing the public of the severity of this disease. and urge the residents of Plano [Orlando] to mark this important day and become aware of the urgent situation and test themselves and their loved ones for this disease. Sandra Silvestri, JDFI (Juvenile Diabetes Foundation International) board member, forum member and mother of a six year old diabetic son, Joey, attended the JDFI World Diabetes Research Conference, held March 16-19, in Athens, Greece, where ribbons made in the US by forum members and their friends and families were distributed to the attendees. On March 20 Sandra wrote the following letter to the members of the Diabetes Forum. I am returned from Athens ..very tired and very jet lagged but wanting to tell you all about the grey ribbon in Athens. 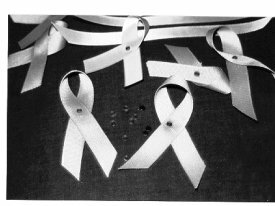 As I told Dave [Groves, Diabetes Forum], the grey/silver ribbon campaign was introduced by James Mulvihill on Saturday night at the opening banquet to the World Conference. As I entered the dining room I spied the ribbon prominently worn on all JDF staff. I was then informed by Karen [Karen Brownlee of JDFI, NY] that the ribbon would be distributed by volunteers during the course of the dinner. At the very end of Mulvihill's opening address to the dinner he talked about the ribbon...how it was begun by diabetics and family members of diabetics and how these particular ribbons came from diabetics and family members from all over for this occasion. The staff then passed out the ribbons you sent and we all pinned them on. They were different sizes and with different colored stones but they all represented something very special. It was very moving to look around the room and see over 140 researchers and their families and JDF members and staff all wearing these ribbons. I was so happy. But I waited for the next morning to see how many would still be wearing them at breakfast. I am so pleased to be able to tell you that I saw A LOT of them again the next day and for all the rest of the days of the conference. I was concerned that the researchers were only wearing them because they did not change their jackets <s> but I began to notice that they had re pinned them on their sweaters, etc. I heard a lot of positive, encouraging comments from JDF members who were in attendance, in particular the London branch members who were very excited about the ribbon. I am looking forward to the chapters and affiliates meeting in June because I know the general membership is going to embrace the ribbon with a great passion. While I was in Athens I also approved the choice of a small piece of jewelry that JDF is going to purchase to distribute at the conference that will be a more permanent version of the ribbon. I want you to know that JDF has embraced the ribbon and the campaign and will continue to distribute it to their members. You have done something very good here on the forum and you should know that wearing these ribbons will mean a lot to all of us who must live with diabetes and those of us who advocate on our behalf. I will try to give you more details on the conference. Many of the sessions ran concurrently and I was only able to attend 4 out of 18 different sessions. But there will be written reports of all the proceedings and I will try to get a copy of the entire proceeding. I do not know what I am able to share with you all regarding this information but I will find out. For the lay person who has a child with diabetes, the most encouraging thing about the conferences is seeing the researchers sharing, arguing, and locked in têt-à-têtes all day and night. There are moments of discouragement also but the process is the most important and seeing that diabetes IS being attacked and considered among these wonderful men. I feel exhausted but comforted, encouraged but frustrated. But I hope hearing about the success of the ribbon brings all of you some much deserved feelings of accomplishment and contribution. Congratulations to you all. Youve seen the distinctive ribbons worn of the lapels of noted celebrities at awards ceremonies and public functionsred for AIDS awareness, blue for domestic violence and pink for breast cancer. These ribbons are important because they make us conscious of those who are suffering from these deadly afflictions. They remind us that with time, money, and hope a cure or a solution might be found and the suffering of millions of individuals ended. Yet, despite the fact that diabetes affects an estimated 16 million people in America alone, there has been no awareness ribbon for diabetes. Until now. Three people with diabetesJoe Garcia, David Groves and Wilma Reiber [Correction: It is not Wilma but her son Bobby who has diabetes]have begun the Gray Ribbon Campaign to raise diabetes awareness. Using the internet, these three activists are getting the word out through the diabetes forum on CompuServe and through good old-fashioned letter writing. "Were trying to form a community of diabetics, because its time for the millions of diabetics to speak out about this disease," says David Groves, creator of the diabetes forum. Regardless of debate over the color, this is a campaign thats been long overdue. These three activists urge people everywhere to buy gray ribbon from their local fabric store and make their own ribbons to remind the public of the silent killer diabetes. Wilma Reiber, who has made 500 of the ribbons herself and mailed them to places all over the world, urges others to make extras and pass them on. Ribbon Goes to White House. Ron Brenners, Texas activist and parent of a diabetic child had already scheduled a meeting at the White House to present his agenda when he read about the ribbon campaign in Diabetes Interview. Believing that the Ribbon campaign would be "a tremendous step forward in getting recognition that diabetes is a life-threatening disease," Ron placed the campaign on his agenda. On March Ron met with Erskine Bowles, President Clintons Chief of Staff.. Ron and Erskine have something in common: diabetic sons. Sam Bowles, now graduating college, has been a diabetic since he was 5 years old, and Benjamin Brenner is eleven-years old. Ben accompanied his father to the White House where they distributed ribbons and presented the four point agenda which includes: faster FDA approval of a non-invasive blood glucose meter; more federal funding for diabetes cure and prevention research; funding for diabetic children without health insurance to attend diabetes summer camps; and designation of May 8 as National Gray Ribbon Day "in recognition of the need to promote diabetes awareness to all Americans." Feeling that he and Ben "made a connection" Ron thinks that if we keep our pressure on Erskine Bowles, "we will have our day." "I hope that my simple efforts will pay off for all of us," says Ron. "I tried to represent your campaign in the best possible light and hopefully you will be proud of my efforts. Ben and I are certainly proud and grateful for all your insight, genius, understanding and tireless efforts to help him and millions of other diabetics, here and around the world." Bruce Beale has announced that the UK'S IDDT (Insulin Dependent Diabetes Trust) Trustees will support the Silver/Gray Ribbon Campaign. Bruce notes that "press statements together with ribbons are being prepared." Watch this page for further details. Park Overall, best known for her role as Laverne, the lovable sharp-tongued Southern nurse on the hit TV comedy Empty Nest (NBC, 1988-91), is an accomplished actress who is currently appearing in John Patrick Shanleys Psychopathia Sexualis, now at the Manhattan Theatre Club in New York. The play is delightful and Overall's performance is spectacular. She lights up the stage. When approached by a Diabetes Forum member after a recent Saturday matinee performance and discussion session, this charming and gracious stars response to news about the Ribbon Campaign was: "Do you have a ribbon for me?" Park, who has had diabetes for thirty years, promptly pinned a ribbon onto her outfit and agreed that a cure is long overdue. After a very successful limited engagement, Psychopathia Sexualis closed April 20. Watch for the soon to be released movie Sparkler in which Park plays the lead.